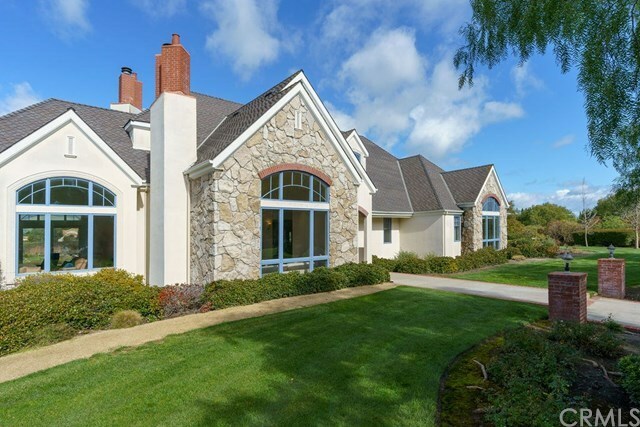 The stunning Edna Valley estate at 6430 Mira Cielo in San Luis Obispo, California is majestically positioned to capture views of the beautiful surrounding greenery and hillsides from every room. Located in the exclusive gated community, Stone Creek, the main home is an elegant English Country estate with 5,128 square feet of living space that includes four bedrooms, four full and one-half bathrooms, centrally-located fully remodeled kitchen, formal dining and living rooms, and a large upstairs bonus room with a fireplace, library, and sweeping views of the picturesque surrounding property. The recently renovated gourmet kitchen offers quartz countertops, new Jenn-Air appliances, a large center island, bar seating, walk-in pantry with custom shelving and a kitchen nook for seating with magnificent views of the property. Additional structures include a detached 667 square foot one-bedroom guest house with a full bathroom, kitchen and fireplace; and a detached pool cabana with a full bathroom. A haven of privacy and relaxation, the expansive 8.43-acre parcel features a gorgeous in-ground pool and spa with a waterfall and slide, built-in barbecue and fire pit, a private tennis court, two backyard lakes joined by a bridge for viewing pleasure, and extensive landscaping including mature trees, sprawling lawns and an orchard. In this home enjoy the quintessential Central Coast lifestyle, located just minutes from nearby beaches, shopping, restaurants and renowned wineries.